Kym Hepworth, Handkerchief (Willow and Urn), 2006. For Handkerchief (Willow and Urn), I used an old white handkerchief with a polka dot border that I bought in an antiques store. 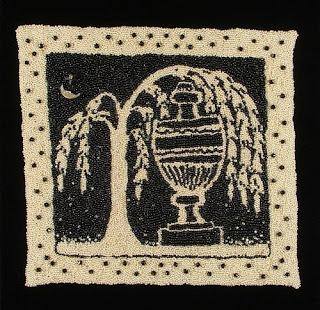 I transferred a 19th century gravestone rubbing onto the handkerchief and beaded it with black and cream glass seed beads. The cream colored beads were a little lighter than I wanted them to be, so I soaked them in a tea bath to give them an "aged" look. Next, I sewed clear beads on the handkerchief to look like falling tears. And, finally, I attached a man in the (crescent) moon and a star with a glittering rhinestone center to the night sky background. The moon and star originally were parts from an earring. Handkerchief (Willow and Urn) is the most direct translation of traditional mourning art imagery in my work. It also pairs materials and imagery together in a straightforward manner - a handkerchief is used to catch and wipe away tears (okay, yes, it also wipes away snot) and my weeping willow tree sheds tears. 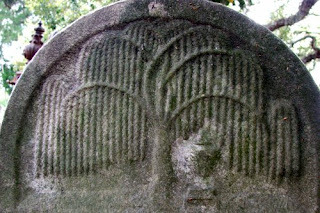 Below are three photographs of 19th century gravestones with the willow and urn motif. 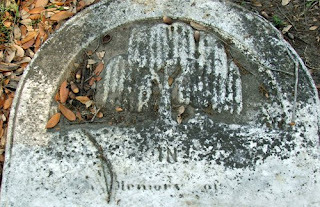 They were taken at Magnolia Cemetery in Charleston, SC. "...Etruscan in origin and suggesting of course the spirit of the departed. In ancient times the urn held both the ashes and vital organs of the deceased, becoming finally a symbolic bed for the departed spirit, a vital part of the death furniture of the tomb house...". 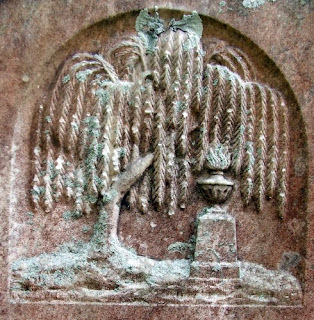 Schorsch continues, "The willow branch was the ancient symbol for the house of mourning, continuing in Christian theology as a trope for the Resurrection because it has the regenerative power to grow again after being cut. Willows have always been associated with burial sites too, because this useful tree drains the ground of water, keeping the site dry for digger as well as departed." While browsing websites, I came across these slight variations in the interpretation of what the willow symbolizes: "...while weeping willows, with their long leafy strands suggesting the hair of a woman bent over in grief, stood for the cycle of life and regeneration." And, "[The willow symbolizes] ...desperation, grief and sadness [because] ...the leaves appear to be tears rolling down the face -weeping." And we're back. I admire the work of Betye Saar (American, b. 1926) and I've included two images from Saar's handkerchief series. The hankie collages, The Loss and Rainbow Babe in the Woods, were autobiographical. 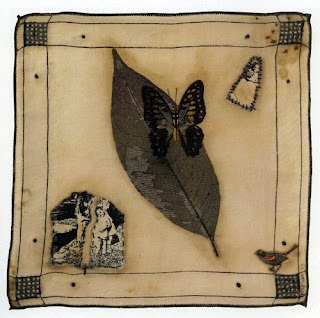 Betye Saar, The Loss, 1977, mixed media on handkerchief, 8 3/4 x 9 1/2 in. Collection of the artist. Photograph by Brian Forrest. "In The Loss, a cotton handkerchief with black trim has a photograph of Saar's father and Saar at the age of four. (Saar's father died when she was six years old.) The photograph is torn in half, and a small black cross has been placed at the bottom of the tear. A black butterfly in a dried leaf is in the center of the hankie. A small photograph of Saar alone is stitched in the corner." 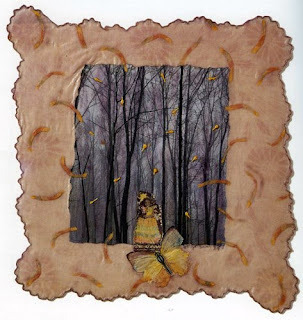 Betye Saar, Rainbow Babe in the Woods, 1979, mixed media on handkerchief, 9 3/4 x 9 in. Collection of the artist. Photograph by Brian Forrest. "A lavendar hankie with a scalloped edge was used for Rainbow Babe in the Woods. In the center, a photograph of trees serves as a background for a photograph of Saar in a flower girl's dress. The dress and the butterfly below are painted in rainbow colors. Fragments of rainbows surround the images. The rainbow symbolizes, as Saar explained, "...the promise that all children have of being happy and being successful and having a joyful life... like the pot of gold at the end of the rainbow. The promise, the promise of being a child"